The programs are implemented to run on a personal computed, under all current Windows operating systems. AMPSolid is a powerful mesh generator for both three- and two-dimensional applications. Mesh generation in AMPSolid starts with the definition of the geometric model. For this purpose, AMPSolid provides the user a variety of CAD tools, such as, creation of simple entities like curves, or solid bodies like blocks or cylinders; edition of the model geometry; and combination of bodies using Boolean operations to generate complex solid models. In addition, during mesh generation, the user may import geometric models generated by other applications, as long as, they are written in the standard ACIS format (*.sat). When the model geometry is completed, the mesh-generation process continues. AMPSolid uses FlexCellTM technology to generate a finite-element mesh for the geometric model. 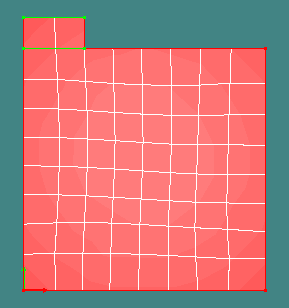 The term "FlexCell" is derived from the "Flexible Cellular" mesh-generation technique. In three-dimensional applications, the process can be done in an automatic or in a semi-automatic mode. In the latter case, the use may intervene at various points to modify the disposition of the flex cells to yield much improved meshes. 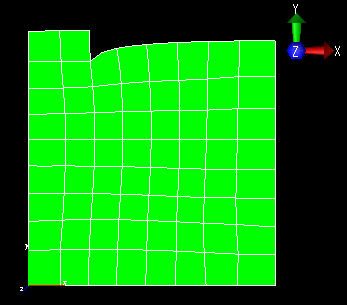 Finally, the finite-element mesh is exported to a file that is understood by the AMPView module. Additionally, AMPSolid allows the user to prepare the final mesh for analysis in the format specified for another finite element code. AMPView is a finite-element tool to serve as a pre-processor and post-processor. AMPView is a graphical environment for the user to define all necessary finite element modeling parameters such as material data, boundary conditions, analysis controls. It links the solid modeling geometry to the discrete FE based modeling specifically designed for FE analysis data graphical association. It controls the AMPSol FE analysis, and then retrieve the results in real-time for user inquiries and examinations. The advanced animation method allowing fast interactive examination of the model behavior, with result inquiry functions such as area/line integral inquiry, user created results type, and advanced cutting plane examinations. AMPView uses a Model DataBase (MDB) to communicate with the solid model geometry and the FE analysis program. Detailed MDB interface manual is available so a third-party FE analysis program can directly interface with the AMPS systems to take advantage of the rich pre- and the post-processing features. 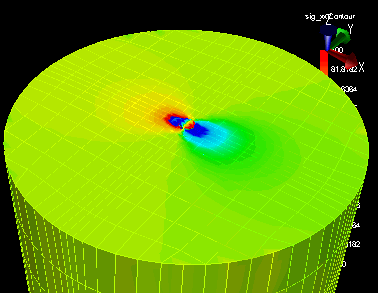 AMPSol is a nonlinear finite-element solver. 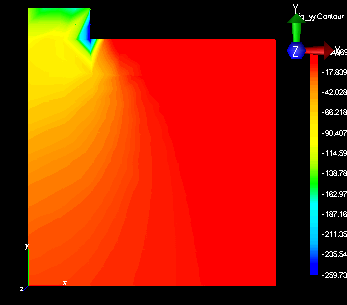 AMPSol is a multi-physics finite element analysis program developed for simulations in stress, thermal, flow, and electro-magneto analyses, including steady-state, transient/dynamic, instability buckling, and modal analysis abilities with fully coupled formulation. It follows the latest and rigorous FE formulations including large deformation/rotation Lagrangian formulation (TL or UL), weighted Optimal Least-Squares fluid formulation with arbitrary Lagrangian-Eulerian extension, automatic load stepping/increment with arc-length post-buckling/instability options, automatic load-balanced multi-thread controls designed for multi-processor workstation. AMPSol provides iterative element-by-element solver, fast direct sparse and the large capacity iterative PCGLSS solver capable of solving millions of equations in minutes. The rich material library includes incompressible Mooney-Rivlin incompressible material, anisotropic thermal/elastic, visco-elastic-plastic model with ORNL extension. The element library contains advanced beam/rod/shell/brick/tetra/pyramid elements with user extendable material model and programmable user load/flux function with access to all solution variables. A three-dimensional model was used for predicting the response of a single pile subjected to axial and lateral loads. Perfect bonding between the pile and the soil was assumed. The pile is 10 m long with a diameter of 0.5 m. The surrounded soil has a diameter of 12 m and a depth of 16 m. Elastic behavior was assumed for both the pile and soil with values of Young’s modulus of 2x107 kPa and 2x104 kPa, respectively. It is interesting to note that the finite-element model allows the diameter and stiffness of the pile and the stiffness of the soil to be modified as a function of depth with little additional effort. Under a lateral load of 216kN, the finiet-element model predicts a deflection of 0.71 cm, while the Poulos method estimates 0.8 cm (Ref. 2). 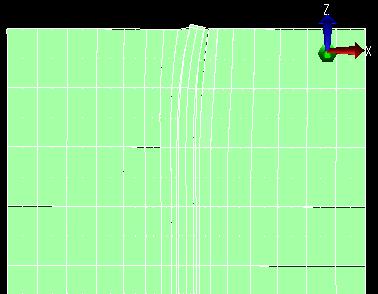 Unlike the axial case, in which 8-node linear elements were used, 27-node Lagrangian elements were used for the lateral case in order to improve the predicion of the behavior. A two-dimensional finite element model under plane strain conditions was used to estimate the bearing capacity of a strip footing. The Mohr-Coulomb model was used in representing the nonlinear behavior of the soil. The elastic properties of the foundation were: E=30,000 psi and ν=0.3. The nonlinear parameters of the soil were : cohesion, c=10 psi, and friction angle φ=20. The finite-element model predicts the load capacity to be equal to 185 psi. Terzaghi's collapse solution estimates the capacity to be 175 psi (Ref 1). A five-story building on stiff clay in Urawa City is modeled and analyzed using AMPS. This structure sits on a piled raft foundation, comprised of twenty piles and a rectangular pilecap. The load capacity and displacement values at the pile heads have been reported for this case. This example investigates the accuracy of the AMPS output as compared to the reported results. The 18.2m-long piles are placed in a four by four grid and vary in diameter, from 0.7m to 0.8m. The pilecap dimensions are 28m by 27m by 1m thick. The piles are assumed embedded in the pilecap, and the entire assembly is modeled as a composite. There are eight distinct soil layers present in this case. Results obtained from AMPs are shown in the figures below. Notice the stress “rings” produced in the soil layers around the piles. An oil-storage tank for a power plant was constructed with reinforced-concrete in the early 1970’s. The underground tank with a diameter of 134 ft and a height of 19.5 ft is no longer in service. Plans for the tank show that there are a total of 37 concrete columns equally spaced on the foundation mat to support the roof slab. The columns have a diameter of 20 in. and are reinforced longitudinally with 6 No. 7 rebars. The roof slab is 9.75 inches in thickness and was designed based on the behavior of two-way flat slabs using square drop panels at the columns. About 2 feet of fill covered by grass sits on the roof slab. The foundation of the tank is a reinforced concrete mat which is 15 inches in thickness in the vicinity of each column, and is 7 inches in thickness elsewhere. The tank is encircled with a reinforced concrete wall, 15 inches in thickness. Because of limitations of space at the site, a portion of the new facilities is proposed to be seated on top of the existing underground oil-storage tank. Engineers proceeded to conduct an initial evaluation of the stability of the tank structure by using a 3-dimensional, finite-element (3-D FEM) model. The results of analyses with the 3-D FEM suggested that the tank is capable to support portions of a new substation after strengthening the existing roof slab. The final location of the transformers was at the south end of the tank, creating an asymmetric loading condition. To analyze this loading, the full tank model was used. The dimensions of the transformer pads are 18 ft. long by 9 ft. wide by 3 ft. tall. The transformer equipment load of 400 kips was distributed evenly across the top of the transformer pads. The mesh size on the top of the tank was made smaller for this analysis, in order to improve the accuracy of the stress results. The maximum displacement in the tank slab is approximately 1/20 in. and is located at the interior corners of the transformer pads. This result is reasonable, as these corners are not underneath a column. The stress distribution in the tank is shown Figures below. Half of the tank has been cut away to reveal the stress in the columns. The tank itself experiences an even distribution; however the interior columns do not. Those columns located nearest the transformers experience the greatest amounts of stress. Chen and Baladi, Soil Plasticity, Elsevier, New York, 1985. Trochanis, Bielak and Christiano, A Three-Dimensional Nonlinear Study of Piles Leading to the Development of a Simplified Model, Carnegie Mellon University, Pittsburgh, 1988. Vermeer, PLAXIS, Tutorial Manual, A. A. Balkema, Netherlands, 1991. Zienkiewicz and Taylor, The Finite Element Method, McGraw Hill, England 1991.